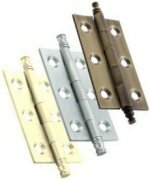 FTD solid brass cabinet hinges available in 50mm x 28mm x 1.5mm and 64mm x 35mm x 2mm. Supplied in pairs with screws. Top Drawer Fittings solid brass cabinet hinges available in 38mm x 22mm x 1.3mm, 50mm x 28mm x 1.5mm, 64mm x 35mm x 2mm and 75mm x 41mm x 2mm. Supplied in pairs with screws. Available in Polished Brass, Satin Brass, Florentine Bronze, Polished Chrome, Satin Chrome & Polished Nickel. Solid brass finial cabinet hinges, available in 64mm x 35mm x 2mm (add 6mm to either side for finials). Supplied in pairs with screws. Solid drawn brass premium cabinet hinges in a pewter finish effect. Available in size 50mm x 28mm x 1.5mm or 64mm x 35mm x 2mm. Supplied in pairs with screws. Solid brass cabinet hinges in a copper finish. Available in 50mm x 28mm x 1.5mm and 64mm x 35mm x 2mm. Supplied in pairs with screws. Double ball catch in solid brass. Fully adjustable using the slotted screw behind each ball, rotating the screw, increases or decreases the spring pressure on each ball. Available in 43mm x 8mm, 50mm x 9.3mm, 60mm x 11.5mm & 70mm x 13.5mm sizes. Magnetic door catch (Steel body), size 46mm x 15mm x 14mm, with 6.0kg pull strength. Solid brass t-handle fastener. Size 57mm x 19mm backplate, 23mm projection. Soft close cabinet hinges to prevent damage caused by banging kitchen cabinet doors. Full overlay, tested to BS6222H, quick and simple snap on installation for upgrading existing doors, 35mm cup diameter, fully adjustable. Heavy pattern desk cable tidy. Inner diameter 62mm, top diameter 75mm, 23mm depth. Available in Electro Brass, Polished Chrome & Satin Nickel. 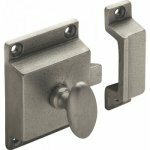 Natural smooth finish, cast iron cabinet latch, ideal for cupboard doors. Overall size 55mm x 41mm, projection 37mm, keep size 55mm x 15mm. All cabinet knobs are supplied with M4 threaded rear fix bolts, however, when it is desirable to fit a knob using a face fix option without a bolt showing from the back then you will need a dowel screw. Available in 25mm overall length size. Magnetic door catch (Nylon Body), available in 42mm x 14mm x 14mm (4.5kg pull) & 56mm x 14mm x 14mm (6.0kg pull).